We were advised by American Heart Association on Oct. 3, that, effective on Oct. 3, there would be a Heartsaver course price increase, in fact, a drastic increase in the cost of certification cards to the Training Sites and instructors. This change was done without advance notice to AHA Training Centers or Training Sites. This change only affects AHA Heartsaver courses (not Healthcare clinician-level courses), but the price increase for the Heartsaver cert. card went up 773%. This is a huge increase, that we are forced to pass along to our Heartsaver students. It appears AHA is moving towards a model of higher priced cert. cards, and lower priced student books, with the goal of more students having the student workbooks before, during, and after training. 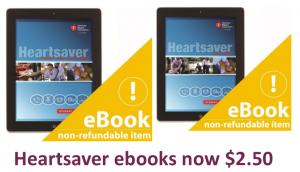 If you like e-Books on your tablet or laptop, the price of the Heartsaver CPR/AED and First Aid/CPR/AED ebooks dropped to $2.50. (e-Books obtained by the student at: https://ebooks.heart.org/ (BLS ebooks remain at $13.25). 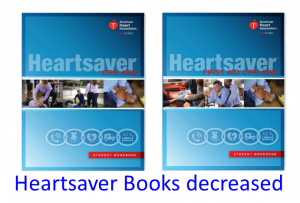 Generally, the Heartsaver course price increase is a certification card price goes up $15, but the cost of student books dropped $7.00 – $12.00. The cost of Heartsaver online courses dropped by $0.50 – $14.00, but that means the net cost of Blended training went up. See our Heartsaver page for all course fees. Effective 10/20/2017, we are increasing our course fees for Heartsaver CPR/AED and Heartsaver First Aid from $45 to $55, and are increasing the course fee for Heartsaver First aid/CPR/AED from $65 to $80, with one exception. The Oct. courses we had scheduled where students had already signed up and paid their money – we are keeping those prices. Specifically, that would be the Oct. 21 Heartsaver courses in Fayetteville. See our Schedule page to sign up. We will continue to strive to offer the best BLS, CPR, First Aid and Emergency Response training in our geographic area for the lowest price to the student. Always with “Same-Day Certification”, as Coweta County’s only AHA Authorized Training Site. Again, so far, there’s no price increase for BLS for Healthcare Providers, so our BLS Provider and HeartCode BLS online pricing remains the same.